If you're gearing up for a job search now as an undergraduate or returning student, there are several bright spots where new jobs and promising career paths are expected to emerge in the next few years. Technology, health care and education will continue to be hot job sectors, according to the Bureau of Labor Statistics' outlook for job growth between 2008 and 2018. But those and other fields will yield new opportunities, and even some tried-and-true fields will bring some new jobs that will combine a variety of skill sets. 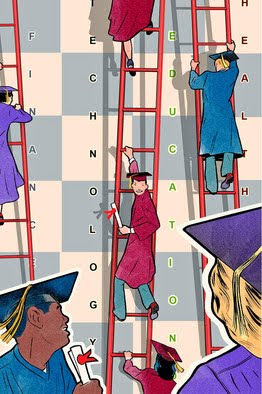 The degrees employers say they'll most look for include finance, engineering and computer science, says Andrea Koncz, employment-information manager at the National Association of Colleges and Employers. But to land the jobs that will see some of the most growth, job seekers will need to branch out and pick up secondary skills or combine hard science study with softer skills, career experts say, which many students already are doing. "Students are positioned well for future employment, particularly in specialized fields," Ms. Koncz says. More than two million new technology-related jobs are expected to be created by 2018, according to the BLS. Jobs that are expected to grow faster than average include computer-network administrators, data-communications analysts and Web developers. Recruiters anticipate that data-loss prevention, information technology, online security and risk management will also show strong growth. A computer-science degree and a working knowledge of data security are critical to landing these jobs. Common areas of undergraduate study for these fields include some of the usual suspects, such as computer science, information science and management-information systems. But those might not be enough. That's because not all of those jobs will be purely techie in nature. David Foote, chief executive officer of IT research firm Foote Partners, advises current computer-science students to couple their degrees with studies in marketing, accounting or finance. "Before, people widely believed that all you needed to have were deep, nerdy skills," Mr. Foote says. "But companies are looking for people with multiple skill sets who can move fluidly with marketing or operations." Social media has opened the door to the growth of new kinds of jobs. As companies turn to sites like Twitter, LinkedIn and Facebook to promote their brands, capture new customers and even post job openings, they will need to hire people skilled in harnessing these tools, Mr. Foote says. In most cases, these duties will be folded into a marketing position, although large companies such as Coca-Cola Co. are creating entire teams devoted exclusively to social media. Similarly, employment for public-relations positions should increase 24% by 2018. Job titles—like interactive creative director—will reflect the duality of the required skill sets. Students will have to study strategy to maximize relationships between third-party content providers and their company's Web team. Other key skills will be search-engine optimization to maximize Web traffic and marketing analytics to decipher the company's target demographic, says Donna Farrugia, executive director of Creative Group, a marketing and advertising staffing agency in Menlo Park, Calif. Many universities and community colleges are offering certification programs focused on burgeoning sectors. For example, the University of California at Los Angeles's extension program offers a certificate in information design. That, program, like similar certificate studies at other schools, aims to give students an edge in Web site search optimization—a major attraction for Web-based companies who want to boost user traffic, says Cathy Sandeen, dean of UCLA's extension program. User-experience design—a sort of architecture for information that Web viewers see—is another emerging field. Jobs there include experience specialists and product designers at firms ranging from computer-game companies to e-commerce Web sites. Ms. Sandeen says the school will offer a certificate program for user-experience design as well, at a cost of about $3,000 to $5,000. The program will run one to two years, depending on a student's schedule, and will couple product design with consumer psychology and behavior. "Our students [will] learn to think like anthropologists, evaluating how easy it is to utilize the products," she says. Not surprisingly, green technology, including solar and wind energy and green construction, are also booming areas. Engineers who can mastermind high-voltage electric grids, for example, will have a great advantage over other job applicants, says Greg Netland, who oversees recruiting for the U.S., Latin America and Canada for Sapphire Technologies, an IT staffing firm in Woburn, Mass. that is a division of Randstad. "Global sustainability will become more important to employers," Mr. Netland says. "It cuts costs, making experts in the field highly attractive to employers." Jobs in alternative-energy systems, including wind and solar energy, will require a variety of skills: engineers to design systems, consultants who will audit companies' existing energy needs, and those who will install and maintain the systems. Despite the slashing of positions seen in the financial sector during the economic crisis, recruiters also expect thousands of new jobs to be created in the compliance field, says Dawn Fay, district New York/New Jersey president of Robert Half International. Ms. Fay counsels job seekers to look at the misdeeds of the past year or two to identify where new jobs will bloom in the financial sector. "It was a year of Ponzi schemes and banking meltdowns," she says. "Be strategic and position yourself as someone who can mitigate those risks." That makes risk management an emerging specialty with strong growth in jobs expected. Those on track to be financial analysts can get additional certification in risk management through organizations like the Risk Management Association or the Risk and Insurance Management Society. "Risk management was a mainstay in financial companies, but I believe it will be present in every Fortune 500 company," says Jeff Joerres, chairman and chief executive officer at staffing firm Manpower Inc.
Health care is expected to continue to see a surge in hiring, with more than four million new openings estimated by 2018, according to the BLS. Hiring for physical and occupational therapists will likely be strongest. But new specialties are popping up, particularly in case management, says Brad Ellis, a partner with Kaye Bassman International, an executive-search firm based in Plano, Texas. Case managers do everything from managing the flow of information between practitioner and insurance company to mitigating risk to the hospital. "If you're a licensed nurse, for example, getting a certificate in risk management from the state board of health would make you extremely competitive," Mr. Ellis says. Harris Miller, president of the Career College Association in Washington, D.C., says IT will be increasingly important in the quest to drive down health-care costs, too. Students specializing in nursing informatics, which combines general nursing with computer and information sciences, at the master's degree level will swap a clipboard for a smart phone to manage patient data. Schools like Vanderbilt University are offering nursing informatics degrees via distance learning, and certification is offered through American Nurses Credentialing Center, based in Silver Springs, Md. The strong push toward making medical records and information more accessible through computerized record-keeping means opportunity, Mr. Miller says. "This is going to require people who are skilled in the hardware and software of nursing informatics."